‘DrumBeats’ is a convenient ‘unofficial’ company name for my drum & guitar tutoring work both privately and with primary & secondary schools in and around Oxford. It is a useful ‘umbrella’ for the current offerings of ‘rhythm in music’ and, hopefully, provides a memorable website address too! 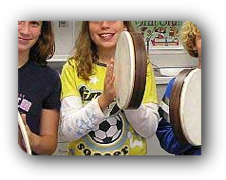 clap your hands, bang a drum or play a rhythm on the drum kit! My name is Nigel Ralf and I developed the idea for drumming and rhythm tuition in the primary school sector after my son and a few of his friends at St Ebbes Primary in Oxford asked me to get them started with drumming. I was at a turning point in career, had experience of private teaching and years of drumming experience and enthusiasm, so decided to give it a go! It turned out to be great fun for all - working on the drum kit, appreciating ‘favourite’ bands, understanding rhythmic qualities of music and learning to grasp the first concepts of limb coordination needed to play the drums. After this first trial course, I received great help and encouragement from family, friends and teachers from local Oxfordshire schools of St Ebbes, St Mary & John and Beckley, who were all very keen to see a general introductory course started at their school. That’s how it started and I haven’t looked back! DrumBeats has now grown to include tutoring in acoustic/electric guitar and we have a large group of tutors to cover our teaching commitments - Me(! )(Drums), Cameron Grote (Drums), Elaine Barron (Drums), Nick Breakspear (Guitar) & John Daniel (Guitar) and Tom Clark (guitar).